Cr2p overlaps strongly with Zn LMM Auger peaks, e.g. in steel samples. Use weaker Cr3p peak instead if chromium concentration ishigh enough to give good Cr3p signal. In the presence of high concentrations of zinc, it may be difficult to assign chromium chemistry using the Cr2p region, due to strong overlap with the Zn LMM Auger region. The secondary chromium peak, Cr3p, shows reasonably large chemical shifts and may be easier to peak fit in this situation. Direct overlap between Te3d and Cr2p peaks. Although Te3d/Cr2p peaks have strong overlap, Te3d spin-orbit components have a 3:2 intensity ratio compared to a 2:1 ratio for Cr2p. Check for the weaker Te3p peaks, if tellurium concentration is high enough. Method for chemical analysis of Cr (III) oxide[1, 2]. 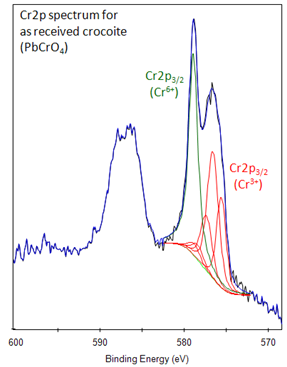 A satellite feature of the Cr2p3/2 peak overlaps the Cr2p1/2 component in Cr2O3. Fit only the Cr2p3/2 component. 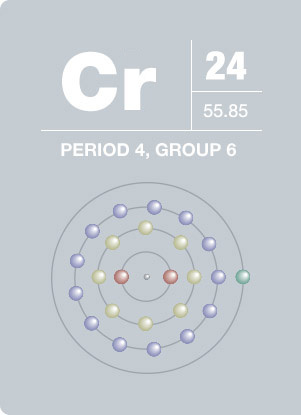 Cr2p for Cr(III) oxide has many multiplet-split components. Correct fitting of multiplet split structure prevents false identification of other chemical states. Native oxide on Cr metal may be a mix of Cr (III) oxide and Cr (III) hydroxide. Cr2p for Cr (III) hydroxide can be fit with a single Cr2p3/2 component. 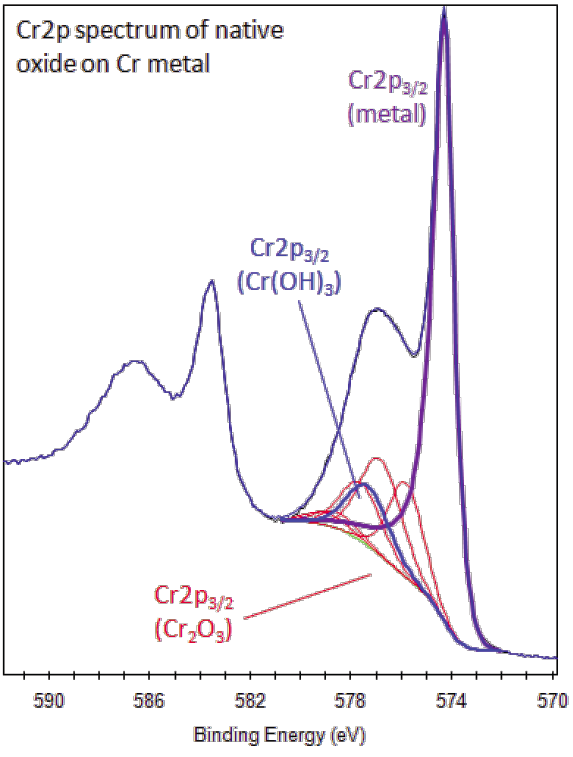 Cr (III) oxide fit with multiplet as shown above and fit Cr metal with asymmetric peak. Air-exposed crocoites (PbCrO4) has been peak fit using a modified version of the Cr2O3 fitting method, with an additional component for the Cr(VI) state. is used in producing synthetic gems.